I don't know how much do You like defrag game mode, but personally I do rly love running. 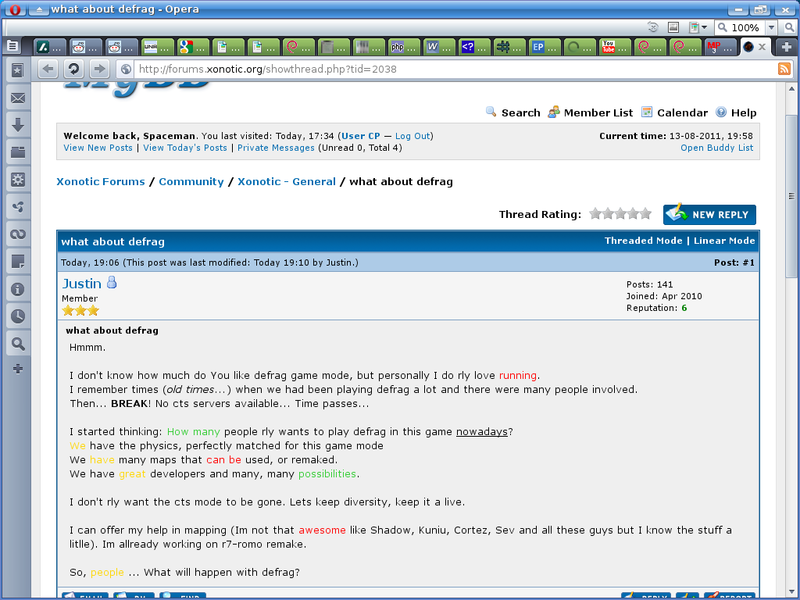 I remember times (old times...) when we had been playing defrag a lot and there were many people involved. I started thinking: How many people rly wants to play defrag in this game nowadays? We have many maps that can be used, or remaked. We have great developers and many, many possibilities. I don't rly want the cts mode to be gone. Lets keep diversity, keep it a live. I can offer my help in mapping (Im not that awesome like Shadow, Kuniu, Cortez, Sev and all these guys but I know the stuff a litlle). Im allready working on r7-romo remake. So, people ... What will happen with defrag? By the way, does anyone know what happened to Fruitiex's server? I have no idea what happened to Fruitiex's [NL] Xonotic XPM race server. Even *I* don't know what happened to it! I'd happily continue maintaining the server if there would be someplace to host it on. Well, Fruitiex, one question, have you got any idea who the hoster was? Shouldn't we just contact him? I like playing CTS from time to time too. I play many game modes, so it's not CTS all the time... Furthermore, I play rather Nexuiz and just look into Xonotic from time to time to see what's going on But yeah, here is another guy who likes defrag. We have great people in yellow, how many green possibilities, red running can be awesome. So you say that great yellow people who have green possibilities can run red awesomely? Let's analyze. So, yellow people may refer to the Chinese, especially when they have lot's of green possibilities, ie. US$. So they can run red (Communism/Socialism) awesomely. Note that China is probably the biggest of USA's creditors. It all makes sense now! Just host a server and you can play it. Simple. Minkovsky, You want me to have on my neck chinese special agents? Anyway You missed the true meaning of that post. Mirio: It is not that easy. First of all someone will have to explain me how to do it, then I think I should have good and fast network connection to host the server (unfortunatly I do not have fast connection). N1mbus, This is what I am talking about], man. Its that all? No more defragers here? What other things that can be done are there? Last thing: Are there any chances for at least official XPM server on next Xonotic next relese? Quick edit: Do not let the colors bother You, k? (08-14-2011, 12:12 PM)Justin Wrote: Are there any chances for at least official XPM server on next Xonotic next relese? (08-14-2011, 12:12 PM)Justin Wrote: Minkovsky, You want me to have on my neck chinese special agents? Anyway You missed the true meaning of that post. Are you two freemasons or something? Because, Mr Justin, you're not hiding it very well. Anyway this thread is not needed anymore. Im very glad to announce that It's me created CTS server which now is available for everyone! And please: Don't search the hidden meaning in my posts. I just like making them colorful. I am your own dumb self (so dumb). I really like XPM mode in Xonotic. Basically I can't play Xonotic these days because the server is down. I can buy some VPS host if any of you want to set up the server. Bbut it is in united states and you guys may feel slow. Anyone know if it can run on Amazon's EC2? If confirmed, I can establish some EC2 server. I have test it working on Amazon EC2. If any is interested in, I will try to create an account for you. Please PM me and we can discuss the server setup in email. The test server is called "your own dumb self 0.5.0 Amazon EC2 Server" (It has almost no maps there though). You are your own dumb self? Then I know you, from my minsta time, I think you might know me as Mepper[NoSkillsOnlyLuck]. But there ready is a race server, it's very kind of you to host one, but it's not needed. If you can't see the server... Do you still use 0.1? Then you can't see it, if you have a new version you need smart people to help you. I can see the server and like it. I just offer some Amazon EC2 servers that can be up 7 day 24 hours dedicated to Xonotic. I don't know what server Justin is running. If he is using his own desktop and his own network for this purpose, I would recommend him using my ec2 server because the bandwidth is guaranteed (1G link I think). and he do not need to keep his own desktop up. It is easy to just copy all the files to the EC2 server and keep running. I can provide SSH access user account if anyone is interested in. BTW, I am using Xonotic's newest git.